Provo Craft sponsored a contest for the official launch of its new E2 on HSN. The contest was to make a banner with any cut but it must spell Cricut. Simple rule- no size, no specified product manufacturer other than Provo Craft. Two entries allowed per person. World of possibilities in execution. I decided that my pennant should have a means of displaying it as opposed to either stretching one’s arms or enlisting a helper. This entry uses Country Life for the pennant shape, the chair is from Summer in Paris, and bats, spider, skull, and ghoulish font is from Happy Hauntings and October 31st. 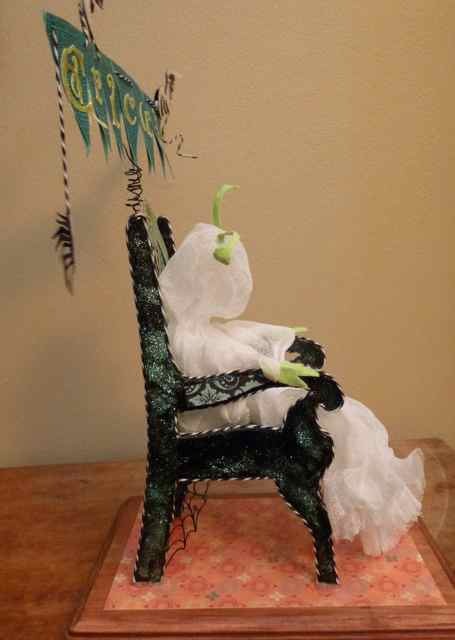 The chair measures about 9″ tall and the banner is attached via a homemade spring with 18 gauge wire from the jewelry crafts department. There are multiple layers of cardstock and chipboard adhered together in order to reinforce the chair. The chair is then “glossy accented” and sprinkled with glitter highlights. The chair and “rug” are attached to a wooden base. For design cohesion, I used black and white bakers twine (around of all the edges in the chair), and black, turquoise, and yellow green for the cuts. The second entry was something completely different for me – a nice little clothesline between two trees. This one is pretty easy to do, and I will share the cut information in case you want to create one of your own for someone in your life. Cut two trees from April Showers at 11 inches. The tree trunks are also from April Showers and cut at 11 inches. Adhere the trunks on top of the tree cut. Pierce two holes on either side of the trunk where you want the clothesline to hang. Cut the dress at 3.3 inches from A Child’s Year – one in pattern and another (hiding the contours) in solid. 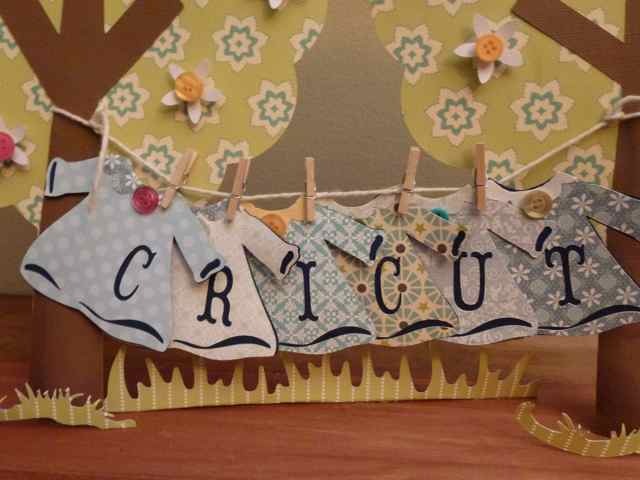 Use your Gypsy or Cricut Craftroom to put each letter along the right hand side of the dress (Storybook at 1″). Attach the patterned dress front to the solid dress front. Cut away the “hangar” by hand with scissors. If you want to add a scalloped collar, punch a 2 inch scallop or cut one using your Cricut. Glue along the edge of the scallop and attach the scallop to the dress in the neck area. You can get at least 2 collars from each scallop. Trim away the excess by turning over the dress, and following along the edge of the neckline with your scissors. Glue a small contrasting button. Clothespin your dresses together to determine the length of your clothesline. Mine are very tightly spaced as I wanted to make sure I could mail this (the total length of the wood base is 18 inches and the edge of the trees do not extend past the base). Use this measurement to determine the distance between the trees and glue two 9″ dowels to a piece of stained wood. In order to get the dowel to stand up straight, I ran the dowel through a wooden pin doll stand piece, and glued both pieces to the base board. Attach the trees to the dowels by centering trunk on dowel. Reinforce trunk as necessary on the back. I cut two inch long strips and attached one end on each side of the tree and over the dowel. Beacon’s 3 in 1 glue worked great for this. Run the clothesline twine using the punched holes. Make sure you go behind the tree and make a loop to attach the twine to the dowel to improve the “carry capability” of your line. 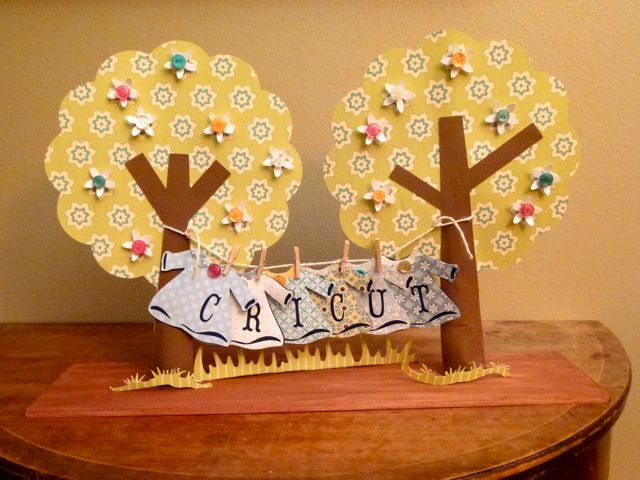 Attach the dresses to the clothesline using those little clothespins that they sell at the big craft stores. Decorate trees as you wish. I used Mother’s Day Bouquet and cut small white flowers at 1 inch. The centers are more of the buttons and colors that I used for the dresses. The width and height of the grass depend on the length of your clothesline. The long cut is from the Martha Stewart Seasonal Cake cart and the two patches around the trees are from A Child’s Year. Wow! 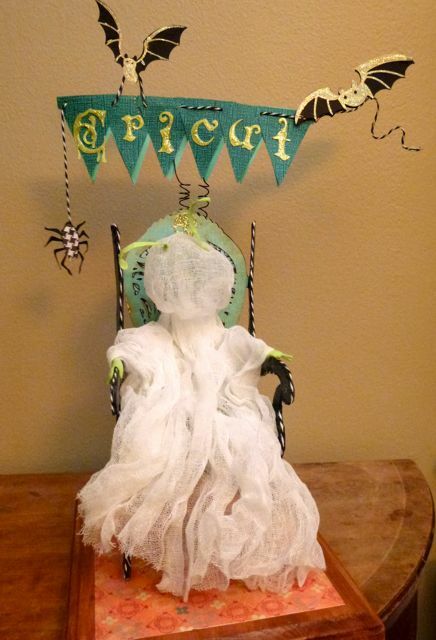 First, the Halloween version: How clever to make a ghost bug! I didn’t even realize it was a bug when you sent the picture to me! Holy cow that is cool! 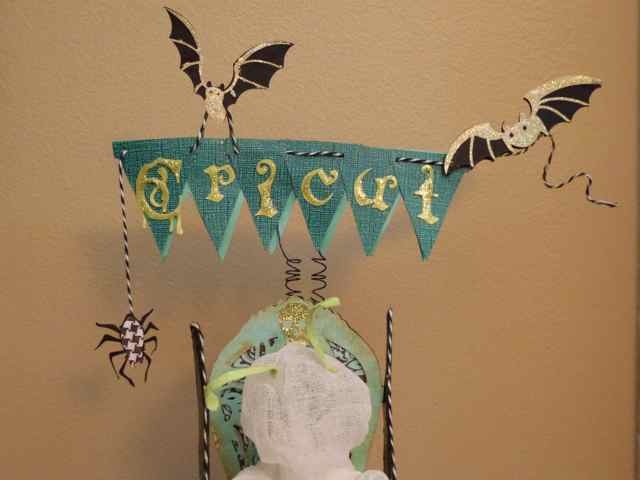 I love that the bats appear to be holding up the pennant– the one tugging at the middle is particually fabulous! Great concept and execution!!! On to the other: I am stealing this idea for a shower! I am in love with this! So clever! I love the dimensional trees and your colors (as always) are perfect! How in the world did you mail this???? I love that your entries are free-standing. That just rocks these out of the park! Best wishes for the contest! Your creativity is so inspiring! I put them in a old Expression shipping box – with the base of the clothesline and the base of the ghost bug, it fit perfectly across the bottom and did not slip. Here’s hoping to gentle handling and paying attention to the up arrow on the box – and extra strength glue and a lot of it! Holy Moly! Let me be the first to congratulate you on your win. Seriously, you have this one in the bag! I had to pick my jaw up off the floor when I saw these. Wow, wow, wow! Thanks for the info in them too. I would love to try something like that one of these days! Good luck (not that you need it! LOL) in the contest. How do you plan on spending the 150.00 Cricut cash? LOL! Two fabulous pennants! Thankfully, Nadia is able to express what I am thinking and feeling about your creations; I just LOVE them! Wow!!! These really are cool! These are aMAZEing!! So out of the box so to speak :D.
I wanted to pop in and tell you how much I appreciate your comments on my blog. You are entirely too sweet. I loved your vision for the cricut banners……so out of the box….and I see that you are busy with a new art project. I enjoyed the pictures Nadia posted and got quite a kick out of that surfboard scene. I just made the connection between this blog and the circle board….I’m a bit dense. 😉 I will be looking for more of your adventures…..sounds like you are having a wonderful time. Thanks for the smiles! Wow, these are so neat – I love the clothesline one especially!! I’d love to have you on my blog hop but I need your email address to send you more information! When you get a minute, go to the contact me section on the top of my blog and shoot me an email so I can get you the information and blog hop button! Thanks! I love these pennants! I see your clothesline pennant every day. It is prominently displayed in the empty cubicle next to mine. Nice job!